During a health break this summer I spent time studying through Leviticus. I’ve joked for a long time that Leviticus is the quicksand for those who try to read the Bible in a year. They cruise through Genesis and Exodus only to get swallowed up by the myriad of ritual regulations from a culture, covenant, and mindset that feels incredibly alien to a 21st century New Covenant Christian in North America. Thus, it wasn’t too surprising when we shared with the church about preaching a series in Leviticus there were some good-natured snickers and head-shaking. I admit, it’s a challenge. 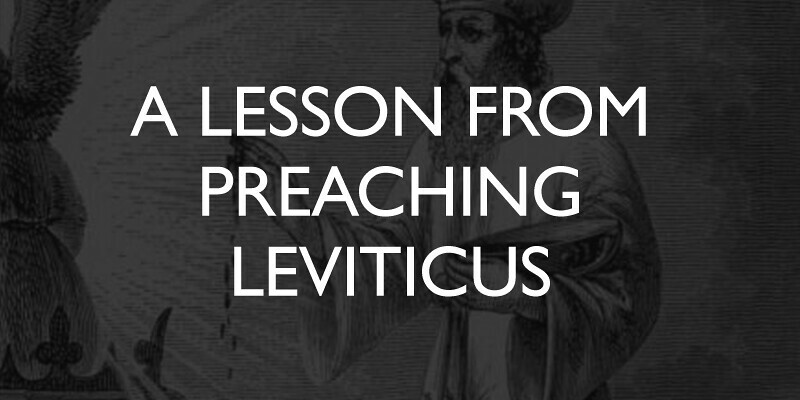 In order to preach Leviticus you not only must give explanation to the in’s and out’s of the Old Covenant sacrificial system but also place what’s happening within the redemptive history of God’s people. This means that in addition to the looking right at the text of Leviticus, one must also look back to Genesis and Exodus while also looking forward to how it all comes to fruition in Jesus in the New Testament. On top of all this, the preacher still has to bring to bear in his illustrations and applications the sermon’s one big idea. And, at least at CCCC, do it within 33-35 minutes. This is where I think many preachers bail. The amount of time explaining feels too great for the sermon to bear. Consequently, many a pastor will stay away from texts, mostly non-narrative sections of the Old Testament, when it comes to preaching the Bible. They may fear the message will come across too academic, or too boring, or too complicated, or something less than what the people need. However, with all of that said, I confess I myself yesterday a little timid about preaching the purification offerings Leviticus 4:1-12. It all sounds good until you actually have to step into the pulpit, look people in the face, and preach God’s Word. I prayed something to this effect before stepping up to preach, “Lord, I believe you will use your Word. I believe Leviticus is written for us to know Jesus more. May we know him more because of the work your Spirit will do in the sermon.” Even after our third and final service I wondered how it went. I too felt like I explained a lot and questioned if I had hit the mark. Then this morning I received several notes about the message and, at the risk of coming across as self-promoting, I thought I’d share one. Yancey, you don’t know me but I’m an occasional attendee at Clear Creek. I attended service this morning and wanted to share with you the experience I had from your sermon. In my 38+ years of life and a regular churchgoer, nothing rattled my faith like what happened today. The message clicked. I always was raised to believe in God, and in Christ’s sacrifice. I grew up going to church every weekend, regular bible study, Catholic school, started up the Young Adult Ministry at my church. But I never fully understood what I came to understand today. Today you made it click, and I wish I could put to words what that did to me. Despite my years of going to church, hearing sermons, studying the faith, reading books, listening to others’ podcasts, something was still missing. I just never quite put together “how” Christ died for our sins. I guess I just took it on face value and but deep down I still didn’t understand it. Hearing that message today I just about fell to pieces inside, part from the relief of finally understanding what this meant, part from the sorrow of what Christ endured, and part from the joy of really understanding why I love Christ because and for the first time it made sense to me what he did and how God worked through Him to be our salvation. I always would say “I love Christ” but frankly I really didn’t quite understand why, until today. The song following your sermon was surreal after what I just heard. And as we left church I noticed I wasn’t the only person with welled up eyes. You struck deeply with a LOT of people today. One of the servers at the door was holding a box of Kleenex that by the time I made my way past it was completely empty. There was a near-silence as people filed their way out today. As my fiancé and I got into the car there was a sort of silence between us, both still trying to process the same overwhelming realization we just had (and she of all people is a very devout faith-goer and teacher at a Christian school, but this still was head spinning for her as well). A few hours later I had to fly out for work and just before takeoff I sent her a text and mentioned “By the way, that sermon this morning really blew me away. Hard to describe. I hope they podcast that one. I kind of feel like I came to understand more about my faith in that 30 minute sermon than in the last 38+ years of my life.” She responded, “I ABSOLUTELY agree with you on that. I was thinking that same thing when we were leaving today.” Your message today was beyond powerful and emotional. And I wanted to share with you the impact it had. I wish I could put to words what happened spiritually with me, and likely with a lot of other people in the congregation. I noticed on our way out that my mom was wiping tears from her eyes as well. She’s 65 and been an avid Christian her entire life, but something must have clicked in her soul as well. God spoke through you today in a way I’ve not seen before. Thank you for that. This from Leviticus, my friends! Leviticus! What do our hearers need most? To see the glory, hope, and wonder of Jesus in the pages of Scripture. All the Scripture. Maybe, just maybe, there lies a whole wealth of truth in the Old Testament through which God wants to speak to his people about his Son in order to grow them in ways you never imagined. Parts of the Bible you’ve stayed away from for various and sundry reasons, but what if, God wants to use those very reasons to display Jesus in a way he’s never done before in your pulpit ministry? I know that was true for me this Sunday with Leviticus. May we follow the lead of the church’s first leaders and our Lord himself – let’s preach Christ from the Old Testament. Your message last Sunday was a home run. I am talking over the center field fence. Thank you!!! This message was so good–everything a believer wants and needs to hear, even if we don’t know it. You brought a message that every soul longs to taste and believe. And the worship after the message was perfect; I didn’t want it to end! Thank you all for delivering God’s word from Leviticus.